Boshi is a Blue Yoshi with an attitude, and the rival of Yoshi. 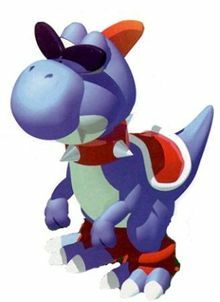 Boshi is a loner and wears sunglasses and a spiked collar around his neck. In Japan, Boshi's name is Washi (i.e. "Bad Yoshi"), created by combining the word "Yoshi" with the Japanese word for bad, "Warui". As such, Boshi is to Yoshi as Wario is to Mario, or Waluigi is to Luigi. Boshi, like many other Yoshis, can only speak the Yoshi language. Yoshi is bilingual and translates Boshi to make Mario understand. He (along with many other Yoshis) lives on Yo'ster Isle, home of the famous Mushroom Derby races. However, he speaks in a much deeper pitch compared to the other Yoshis. One day, Boshi defeats all the other Yoshis in a race and becomes the champion of the Mushroom Derby. Boshi then calls himself boss of the Yoshis. Under his reign, the races of the island are canceled. In fact, Boshi himself is the only one allowed to use the racecourse. Although the other Yoshis disliked Boshi's rule, they felt obligated to obey the champion of the derby. During the events of Super Mario RPG: Legend of the Seven Stars, Mario travels to Yo'ster Isle via the Pipe Vault. Once there, Mario meets up with his old friend Yoshi. The green Yoshi delivers the bad news of Boshi's reign, and Mario decides to help free the island. 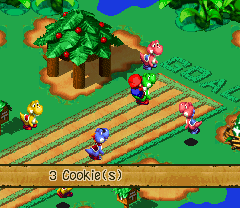 Yoshi recognizes that Boshi has a weakness for Yoshi Cookies and asks a friend to loan him some cookies so Yoshi and Mario can confront Boshi. If Yoshi can win a race against Boshi, then he will become the new champion of the Mushroom Derby, causing Boshi to lose his authority. Boshi, who would never decline a wager with Yoshi Cookies on the line, agrees to a race. If Yoshi wins the race and becomes the champion of the Mushroom Derby, the other Yoshis congratulate him and demand that he become the new boss of the island. Yoshi declines the offer, stating that the races should be free for everyone to participate in, not controlled by a boss. Yoshi's words even reform Boshi, who agrees to participate in fair competition. Boshi, however, still likes to stick to himself, but he has learned to enjoy the spirit of competition. Proving he is still a good runner, Boshi manages to win a race every once in a while; however, he is not the dominant racer he made himself out to be. The ending cinematic of Super Mario RPG: Legend of the Seven Stars seemed to show that Boshi had befriended Croco after the latter had apparently moved to Yo'ster Isle. Boshi is the only known Yoshi to not wear shoes that cover his feet, to have fangs, and to have only two scales on the back of the head. This page was last edited on March 27, 2019, at 15:07.